When I was a kid I had several beautiful encyclopedias. In one of them there was a description of moon orbiting on of the gas giants that had huge ripples all along its surface. It said in the text that it's plausible to think that the moon was torn apart and then got stuck back together. Could you remind me which one is it? I would like to read a little more about it. Three large grooves, each > 200 km long, cover parts of the surface (the "scar" you talked about). These are the coronae. Observations indicate that some parts of the surface appear less than 100 million years old. Verona Rupes, a 10 km-high cliff, is the largest in the Solar System. Other, smaller, rupes exist elsewhere on Miranda and across the Solar System, but not quite as high as this one. Alternate explanations include heavy crustal activity in the past. Tidal effects from Uranus may also have played a role (either at different times than the putative impact, or instead of it entirely). Gas giants strongly interact with their moons through tidal forces; cases include Io's volcanism, driven by Jupiter, and the covered oceans of Europa and Enceladus. 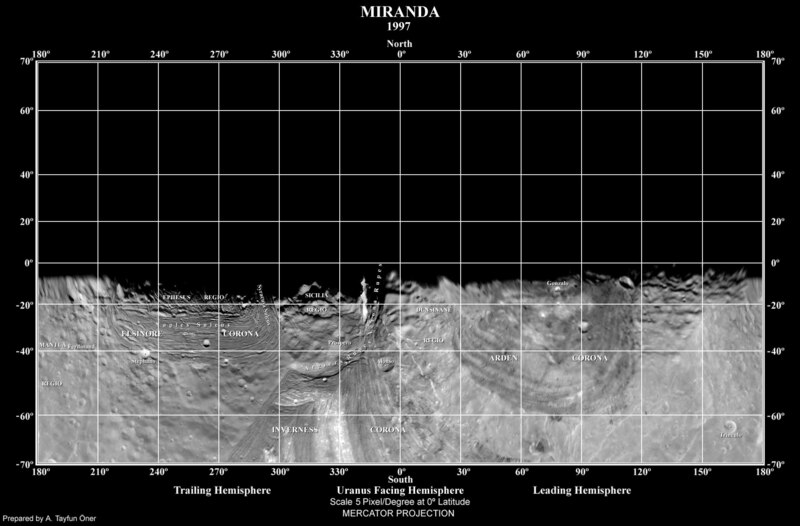 You are probably thinking of Miranda, a moon of Uranus. It is currently thought that the varied terrain (including the 10km high cliff called Verona Rupes) is more likely due to past geological activity driven by tidal heating, although a massive impact has not been completely discounted. The impact hypothesis was first suggested after the Voyager fly-by in 1986. Not the answer you're looking for? Browse other questions tagged natural-satellites gas-giants or ask your own question. Which planet or moon has all resources that can be used to sustain life in a controlled biosphere? If Venus had moon before and it fell back to Venus, why don't I see a unique, very big crater? If a captured moon has prograde, circular and equatorial orbit, can we know it is captured? Is there any planet out there which is half gaseous and half rocky ? is this possible?